Just tried this with WMMT5 on a G29. Max 100 FFB is not kidding, even the little road divider things made my wheel shake. Thanks for the work, it's great! I read the wheel specification has vibration feedback, is it possible to apply the plugin? 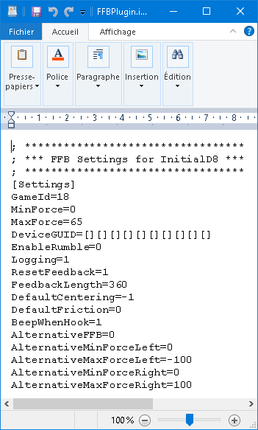 I already follow step by step to apply the ffbplugin v0.2 but never got force feedback. Hello, Im trying to get this working on Daytona 3 and G29, got my guid from the log, but where do i get the gameID from? currently its set to 1 but im not sure what it should be. I am not getting any FFB in the game. I buy a G29 last weekend and test game with this. I find that the steering wheel is difficult to turn left and right and I try to adjust it so that it is softer in the direction a bit like driving a car equipped with power steering. Yesterday I tried the pluggin first with Daytona 3 which works very well. On the other hand I tested with other games like Sega Racing Classic and WMMT5 and the game starts well and when the game starts after a few seconds I have an error message that tells me .... exe to stop to work and must be closed .... and nothing more the game is blocked I can only answer the message and return to the desktop. If I restart these same games but without the pluggin by removing the 4 files the game works well ???? DeviceGUID = here your UUID of logitech G29 that I recover in the file log.txt in the directory of the game when you will launch it. That is true for the original release. I thought in TP's case it would work anywhere. for those who have a G29 know if there is a menu similar to the image? Trying to understand what you mean, but if the ffb is too strong while turning then lower maxforce. I'm not sure why wmmt5 and src would crash, works fine here. Perhaps you are missing a visual runtime or something? what you think of my seeting ? The Xbox one controller wheel. can you help me for setting rumble? can you tell me if i can hack for example the original ffb board from an arcade machine like cruisi'n world? if yes can u help me to find a schematics? thanks! Boomslangz i just tried the Daytona USA Championship with TP(for feedback/rumble effect) and i followed the steps mentioned for the TP non-lindbergh titles in order to get the Rumble working for Daytona but sadly the rumble doesn't work! Is there anything that could have gone wrong? In order to get the rumble working for a stand alone release i read that the games needs to be in the C drive. Does this apply when playing Daytona USA in Teknoparrot as well? Another issue, my car is auto accelerating by itself! Is there a fix for that? Boomslangz, je viens d’essayer le Daytona USA Championship avec TP (pour le feedback / rumble) et j’ai suivi les étapes mentionnées pour les titres TP non lindbergh afin de faire fonctionner le Rumble à Daytona mais malheureusement, le rumble ne fonctionne pas! Y at-il quelque chose qui aurait pu mal tourner? 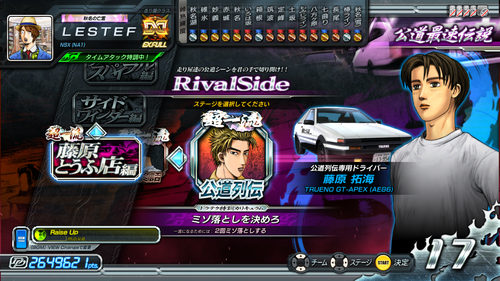 Afin de faire fonctionner le son pour une version autonome, j'ai lu que les jeux devaient être dans le lecteur C. Est-ce que cela s'applique également à Daytona USA dans Teknoparrot? Un autre problème, ma voiture accélère automatiquement d'elle-même! Y at-il un correctif pour cela? Salut as tu bien pensé à copier/coller Dinput8.dll dans le dossier exe du jeu ? Hi have you thought to copy / paste Dinput8.dll in the exe folder of the game? dinput8.dll is already there in the game exe folder. Also my Teknoparrot 1.80 is NOT in the root of C Drive. For car acceleration tell me which .ini file to edit and which line. Weird enough there was no GameSettings.ini file in my Shell Data folder. Eventually i had to copy it from my stand alone Daytona USA Championship release and it has fixed my problem. The FFB still doesn't work. What am i missing in that respect? I copied all those ffb files provided by Boomslangz for Daytona USA and added my gamepad ID as well. I even get to hear the beep sound when the game is being launched by TP. But no rumble. however, I have fixed this for next tp release already so as soon as that is released then it will work anywhere. J'ai essayer de garder un maximum de sensation au volant, sans être obliger de forcer sur le volant (c'est jouable a une main avec cette config, pour ce faire une idée). ça va servir, c'est sûr! quand tu dit les accoups de volant après la ligne d'arrivée, tu fait référence aux secousses ressentit dès que la course est terminée, c'est bien ça? Oui oui, c'est tout a fait ça ginzu. J'ai un G29 et je ne vois pas ou je peux voir ce menu ??? This plugin is awesome, great job Boomlangnz now games like Daytona championship usa,id8,Mario Kart just feel so good on my Direct drive wheel with Simucube, just don't have the overall strength set at 100% with this sort of wheel or it will try and pull your arms off. bsr on met ou l'effet forcefeedback ds quel dossier ?? salut soso, c'est dans le driver logitech ("Profiler" pour les Volants logitech G25, 27 et d'autres) j'ignore si c'est encore le cas pour le G29. tu devrais pouvoir appliquer un réglage spécifique dans le même genres que mon exemple. 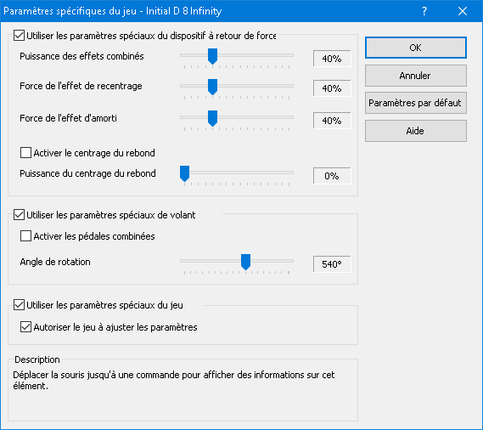 sinon au pire, sur windows, dans les périph, clic droit => propriété sur ton G29, mais ce sera un réglage par défaut pour ce volant et le reste de tes jeux. The plugin supports mame 0.199 , but unfortunately there is no 0.199 groovymame available to try (goes from 0.197->203). (for example cruisn series is 57.34hz horizontal resolution and not 60hz as mame renders - groovymame outputs it correctly). Hi there, since i use a pad i found that our plugin works great but the feedback strength is very weak (at least in the case of xbox one controllers). Is there a way to increase the feedback strength above 100? Also i would love to get those "impulse triggers" working on my xbox one controller. Can you look into it and get them working as well? didnt want to post twice.